In a large bowl add in lemon rind, lemon juice then start whisking as you add in olive oil, honey, dijon mustard, salt and pepper until combined well. Add in corn, basil leaves and red onion then incorporate into the dressing. In a large platter layer baby arugula then top with crap meat and tomatoes. 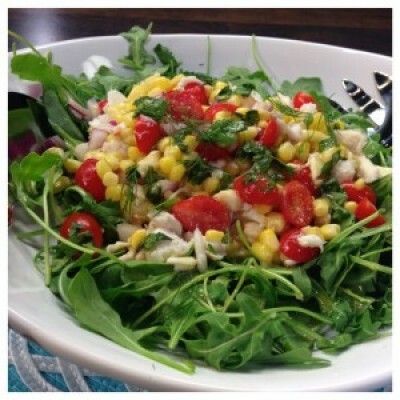 With a large spoon add the dressing with corn and onions over the crab meat.